The 2015 edition of the extremely affordable Motorola Moto E has arrived to Mobile World Congress 2015, and that's a great opportunity to spend some time with the cute 4.5-inch Android 5.0 Lollipop device. The Moto E (2015 edition) is already on sale in retail stores, and this will be just a quick look as we gear up for our full-on review of the device. The original Moto E featured a fairly mundane plastic design, and while the material remains plastic in the Moto E (2015 edition), Motorola / Lenovo is introducing a colorful touch with an interchangeable band that wraps around the sides of the device. This is a nice touch as it allows users to personalize the phone with their choice of color, but also because this is the place where phones get damaged the most, and you can just swap the band with a new one and have the Moto E (2015) look as pristine as new. The other change from the Moto E (2014 edition) comes in the display department where we now have a 4.5" 540 x 960-pixel (qHD) display, up from the 4.3" qHD screen on the original. The display resolution remains on the low side, and with a pixel density of 245ppi, you can notice some slight pixelization. That is one of the compromises that comes with the low price tag of the new Moto E. On a more positive note, colors do seem to appear fairly vibrant and good looking. The new Moto E comes in different configurations depending on the market. The version on sale in the United States features 4G LTE connectivity and a Snapdragon 410 system chip at a full retail off-contract price of $149.99. There is a cheaper version of the Moto E that does not feature LTE connectivity, and that model is equipped with a lower-grade Snapdragon 200 SoC. Both models come with 1GB of RAM, and 8GB of internal storage that you can expand on with microSD cards of as much as 32GB. The Moto E 2015 edition runs on Android 5.0 Lollipop with a very minimal skin (the biggest difference is in the camera app, which features the dial menu we've seen in earlier Motorolas). It runs fairly zippy, great for such an affordable device. The handset sports a 5-megapixel auto-focus main shooter with an f/2.2 lens and the new phone has also gotten an LED flash light. The camera is capable of recording videos of up to 720p, and the camera app supports HDR shooting and has a panoramic shooting option. Up front, there is a VGA selfie cam that will also come in handy for video conferencing. Best of all, the new Moto E is already up for sale and you can buy it online and at retailers in the United States for the afore-mentioned price of $149.99. The Moto E LTE version also has an AMOLED display. 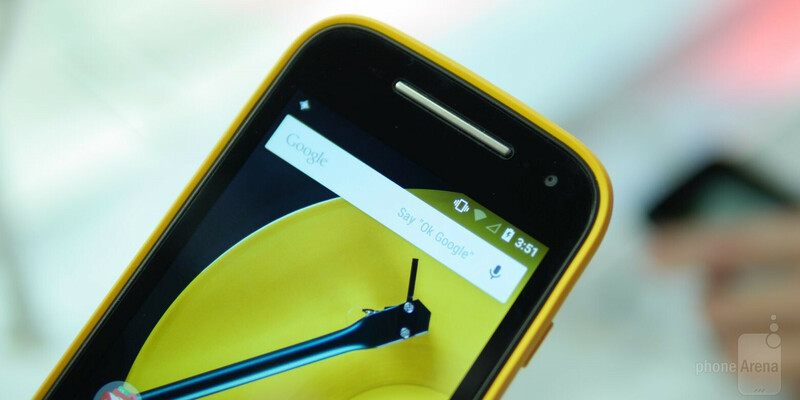 The Moto E GSM version comes with an IPS display. "The handset sports a 5-megapixel auto-focus main shooter with an f/2.2 lens and the new phone has also gotten an LED flash light" - where is the flash ?? invisible !! The flash is in the white ring around the camera. Just like with the other newer Motorola devices. A great phone for those who don't demand the highest specs. A real bargain too. Where is an LED flash ?